Only participants who register before September 1st are guaranteed a pair of official 2019 Tour des Suds socks! Kids are FREE but need to register in order to receive a bib and results. Friday, September 13, 2019 3:00-7:00pm: Early number plate pick up at the MTF Offices (1665 Bonanza Drive, Park City). Avoid the morning rush and pick up Friday! COURSE INFO: View Course Map. A mass start will begin on Park Avenue at the entrance of Park City’s, City Park to the top of Guardsman Pass. The distance is approximately a 7-mile hill climb on single and double track trail, with a 2,700′ elevation gain. From City Park, we ride up Park Avenue turning left on Heber Ave then Right on Main Street and continue up Daly, by the water tank. Left at intersection uphill on Service Rd. (Ontario Bypass), turn right at next intersection and stay to the far right where the single track skirts the dirt pile, follow Ontario Bypass/Tour Des Suds signage to the Guard Rd. Cross the Guard Rd and continue on Ontario Bypass/Tour Des Suds to intersection with Mid Mt Trail. Turn right on Mid Mt and continue on it until you reach the Tour Des Suds intersection. Go left on Tour Des Suds and continue up to the service rd. Turn left on the service road and continue to the next intersection. Go left (short downhill) on service road until it runs into the Team Big Bear single track where you will veer right. Stay on Team Big Bear until the Flagstaff loop intersection. Take the left most single track for about .6 mile, veer right on grassy double track and then a quick left onto single track until you hit the dirt road. Trend uphill on the dirt road for a few hundred feet and then turn left onto double track, followed by a hard right onto single track. Stay on the single track until you hit pavement. Turn left (uphill) on the street and then continue downhill, veering left in between boulders on gravel road to the finish. Dogs are not allowed. Please Note: Course is subject to change without notice. 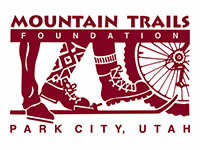 Besides building, maintaining and advocating for non-motorized trails in Park City and the healthy lifestyle they promote, the Mountain Trails Foundation puts on four annual competitive trail events: Round Valley Rambler, Jupiter Steeplechase, Mid Mountain Marathon and Tour des Suds Mountain Bike Race. All 3 events showcase our world class trail system and are a tremendous funding source for the organization.